BATSTORM has published the final version of the ten-year (2018-2027) research and innovation (R&I) roadmap on battery-based energy storage. BSEF contributed to the roadmap by sharing its views on bromine based energy technologies and market developments for energy storage systems based on batteries. 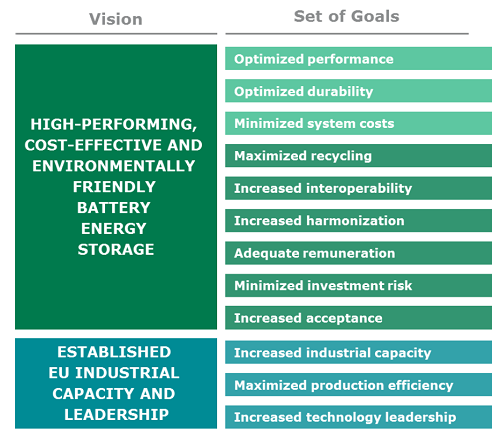 The roadmap will detail actions that should be taken for the development and deployment of high-performing, cost-effective and environmentally friendly battery energy storage in the EU energy system and to established EU industrial capacity and leadership in the global battery sector. The scope of the project are stationary rechargeable batteries with an energy content higher than 5 kWh, including the necessary systems for battery management, and interfaces for grid connection. The final version of the Roadmap for R&I and accompanying measures 2018-2027 as developed within the BATSTORM project is available on its website. You can view or download it here. Figure 1: Overall strategic objectives and accompanying goals of the roadmap. The Batstorm project is working towards an R&D strategy for battery based energy storage. In this 2-year project, Batstorm aims to support the European Commission in the progress to identify and support RTD&D needs and market uptake of battery based energy storage as one low-carbon technology of the future energy system. BSEF is the international bromine producers organisation. Since 1997, the organisation has been working to foster knowledge on the uses and benefits of bromine-based solutions. BSEF strongly believe in science and innovation. Through investments in research and development BSEF members create robust bromine-based technologies meeting the needs of society. The members of BSEF are Albemarle Corporation, ICL Industrial Products, Lanxess and Tosoh Corporation. Further information: Visit www.bsef.org to learn more and follow BSEF on Twitter @BromineInfo for the latest news and information.